Abstract : We propose a framework to investigate a new way to learn musculoskeletal anatomical kinetics using interactive motion capture and visualization. It can be used to facilitate the learning of anatomy by medicine and sports students, and for the general public to discover human anatomy in action. We illustrate our approach using the example of knee flexion and extension by visualizing the knee muscle activation prediction with agonist and antagonist co-contraction. Muscle activation data for specified movements is first measured during a preliminary phase. The user is then tracked in real time, and its motion is analyzed to recognize the motion being performed. This is used to efficiently evaluate muscle activation by interpolating the activation data stored in tables. The visual feedback consists of a user-specific 3D avatar created by deforming a reference model and animated using the tracking. Muscle activation is visualized using colored lines of action or 3D meshes. 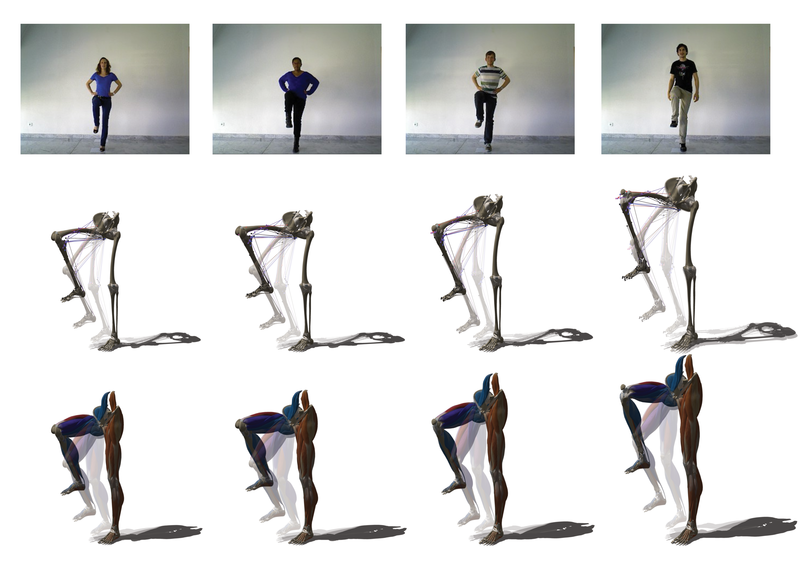 This work was made possible by the collaboration of three complementary labs specialized in computer-aided medical intervention, computer graphics and biomechanics.